On Saturday, July 27, twenty-three teams descended on Northwood Park in New Hope, Minn. to play wiffle ball and raise money for colon cancer education, prevention and screening at WIFFLIN’ VS. CANCER. 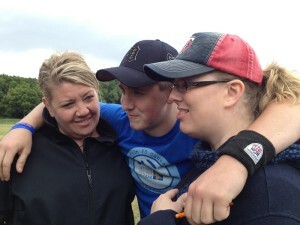 Planned by Brandon Burns, 17, with help from his family and friends, the tournament raised over $7,000 for the Colon Cancer Coalition / Get Your Rear in Gear. The money was raised through entry fees, silent auction, sponsorships, and food sales. Burns began planning the tournament in October 2012 a little over two years after his mother, Shannon (43), was first diagnosed with stage III colon cancer. He spent much of his junior year building strikeplates, securing sponsors and soliciting nearly 25 silent auction items including: an Ipod touch, MN Twins tickets, Beats by Dre studio headphones, A GoPro camera, a limited edition Matt Blair photography print, and a Justin Morneau autographed 16×20 photo. 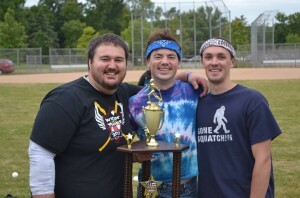 The winning team, ‘Stache Swag, took home the trophy and bragging rights from the inaugural Wifflin’ Vs. Cancer. 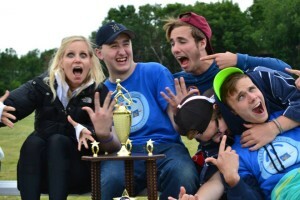 Anne Carlson, Colon Cancer Coalition Executive Director (left), celebrates a successful Wifflin’ Vs. Cancer with Brandon Burns and his co-coordinators. 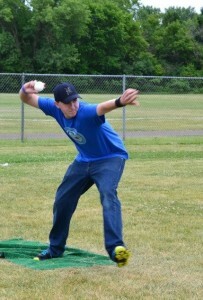 Most photos provided by Wifflin’ Vs. Cancer, see more on their Facebook page. Photo of Kelly, Brandon, and Shannon was taken by Anne Carlson.